In October 2008 when I first met Seema and Luciana in my Japanese language class at Kyoto University we started to form the idea of exhibiting together. They were both artists as well and the unification of our efforts seemed strategic. Over time the reason for showing together became more about our shared interests and experiences than anything else. 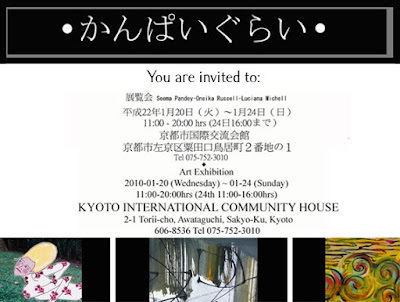 So one year later, in December 2009, while Kyoto was emptying out and offices were closing down for the Winter holidays we went portfolio showing. We met many and galleryists and over time the right exhibition space appeared. So now, if you happen to be in Kyoto during January 20-24, I invite you to come by the Kyoto International Community House's gallery to see a group exhibition of 3 overseas artists.